I am not sure how often, or if ever, people get to meet their “opposite” in life. I have encountered my “opposite’ many times. 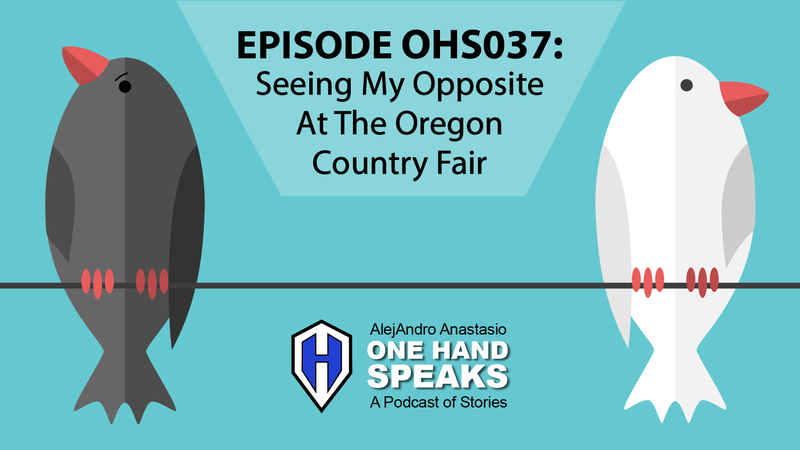 This occurred ever year for about four years while attending the Oregon Country Fair (OCF) in Veneta, Oregon. I started to attend OCF in 1993. For the next twenty years it was part of my yearly schedule. In the later years I was a youth empowerment speaker at The Youth Stage. “The Fair” has been a very large and special part of my life. I have already done one podcast about my time at OCF (Episode OHS020) and I plan to to do many more including this one. Many great and profound moments I have experienced during those three festival days. A have seen long list of great bands and concerts, purchased high quality handmade items, and made many life long friends. But to see my one-handed “opposite” four years in a row is an experience I will never forget. my one-handed opposite attends the Oregon Country Fair. What is means to me to see my opposite. Talking to people who encountered or were impacted by my oppostie. My sci-fi metaphors for what would happen it I physically meet my opposite.